Maybe in the olden days, Diana. But I don’t know if you noticed: this isn’t the olden days. No one allegories or alchemises no more. 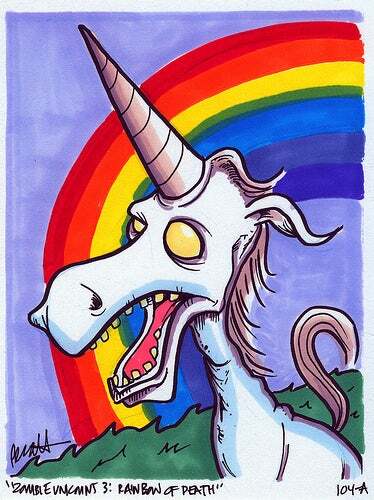 Unicorns are metaphorically as dead as the dodo. 1. Justine says that zombies are so chilling because they represent inescapable death and that unicorns have no resonance. This is massively untrue. Unicorns symbolize eternal life, hence their healing powers and their association with both religious figures and kings. Eternal life can be pretty chilling. 2. For example, but also as a separate point, the photoshopping and painting of Obama with unicorns and McCain with (or into) zombies as a means to make a political argument. Unfair? Maybe, but resonant. (I did find a single McCain unicorn picture, for anyone who's interested in that kind of thing.) 3. Unicorns are interesting because there is something to subvert, something to transgress. No one wants to see the zombie transgressed. Well, only crazy people.